Meet The 15-Year-Old From Rural Guatemala Who Addressed The U.N. : Goats and Soda Back in 2012, Emelin asked the mayor to help the girls of her town. He laughed in her face. But she didn't give up. This week, she told the U.N. General Assembly about her efforts. 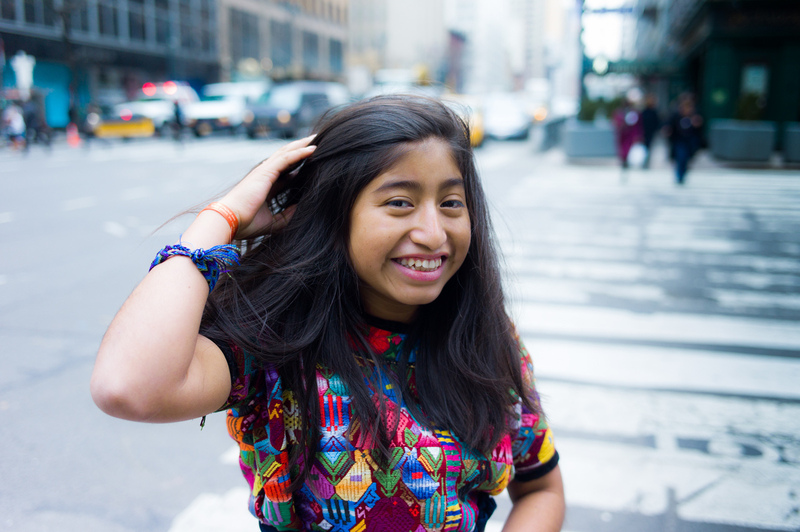 Meet The 15-Year-Old From Rural Guatemala Who Addressed The U.N.
Emelin, 15, spoke at the United Nations this week about her efforts to improve the health and education in her town in Guatemala. When Emelin was 13, she asked the mayor of her rural Guatemalan town to find ways to help girls stay in school and get better health care. He laughed out loud. "You are wasting my time; you should go home," he told Emelin and her friend Elba, who had come with her. "The biggest problems we face as adolescents in my community are early pregnancy, [child]birth, sexual violation and lack of education and health care," said Emelin (whose last name is not provided because of her age) in the speech, which she wrote and presented in Spanish. "We [adolescent girls] have a voice and we are going to use it." Emelin lives in Concepción Chiquirichapa, which is located in the rural western highlands of Guatemala. Ninety-five percent of the population (including Emelin) are Maya Mam, an indigenous group that was one of the most persecuted during Guatemala's civil war. Only about 14 percent of girls there finish secondary school and about half have their first child by the age of 18, according to Denise Raquel Dunning, the founder and executive director of Let Girls Lead, a nonprofit organization that trains adolescents to advocate for education and health rights for girls and women. And Let Girls Lead lived up to its name. It gave Emelin and her friend Elba a chance to make a difference in their community. Through a Let Girls Lead initiative, the two teenagers met Juany Garcia Perez, who worked with the group and another nonprofit focused on girls' leadership. Juany became their mentor, teaching them about self-esteem, human rights, community organizing and public speaking. And they used these skills to make an impression on their village. They were interviewed in the newspaper; television and radio covered their campaign. And ultimately the mayor did pay attention to them. Although they thought it would take longer, it was only seven months from the initial knock on the door to the mayor's signing legislation to fund education and health care efforts for girls in 2012. Emelin was motivated to work for change after her parents separated when she was 12. Boys started making fun of her. "They said that my family were losers because we weren't together," she recalls. Around the same time, she learned that her friend Elba, who is two years older, was also "suffering from her father's alcoholism." Together, they decided they wanted to change the mindset of parents and adults — "the mindset that it was normal for girls not to finish school." In their opinion, dropping out shouldn't be normal. The mayor's own adolescent daughter, Emelin and Elba pointed out to the mayor, "could end up suffering the same problems if he did not make change happen." Emelin smiles easily if shyly. Like many 15-year-olds around the world, she chews gum, texts and takes pictures on her cellphone. She's bilingual, fluent in her native indigenous language of Maya Mam as well as Spanish. For fun, she likes basketball, knitting and embroidery. She wore two examples of her handiwork at her U.N. appearance: a brightly colored geometrically patterned huipil (traditional blouse) and a handsome black and cobalt striped Maya Mam woven belt, which she made when she was 10. "It has great meaning to me because it was the first I made," she says, "and it showed me I could make something myself." Emelin's trip to the United Nations and New York is her first outside her country, but she has had little time to sightsee or shop. Her short-term goal: "I want to buy some souvenirs and some shoes" before leaving. Her longer-term goal is more serious: "Perhaps I could be a president for my community or my country and in that way have more chances or opportunity to help children and adolescents." And maybe, even speak again at the United Nations.